As the capacity of cordless tool batteries continues to increase from 3Ah to 4Ah to 5Ah, the charge times of each larger battery pack also increases. Consequently, more so than before, there is a need to be able to charge faster. The 48-59-1807 Rapid Charge Station has room to hold (3) M18 batteries and (3) M12 batteries, allowing the user to add and remove batteries as they are ready. 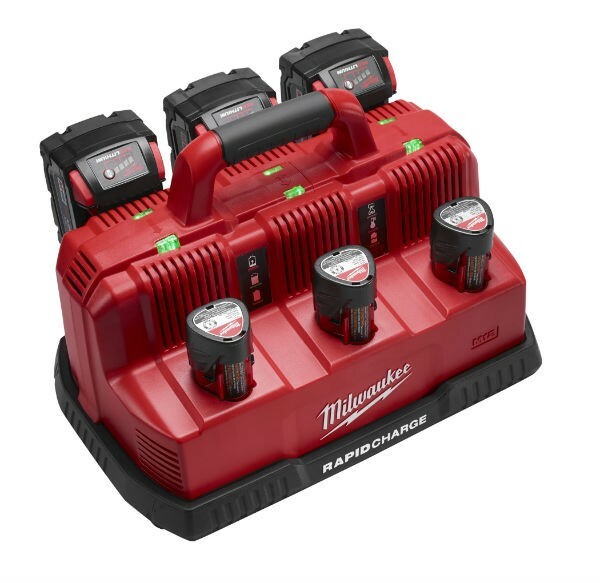 Using Milwaukee’s Redlink intelligence hardware, the charger is optimized to quickly charge while monitoring each pack’s health to protect against over-charging and over-discharging. While (1) M18 XC battery in their previous charger takes 60 minutes to charge, it takes only 37 minutes in the Rapid Charge Station. Better still, it can charge (6) M18 XC batteries in 74 minutes. Other notable features of the Milwaukee Rapid Charge Station include a pass-through plug that keeps the outlet open for other tools, and a light that indicates when a battery pack is 80% charged-for those in a real hurry. The 48-59-1807 Rapid Charge Station will be available starting in February.